First of all, no one is just a clerk or dishwasher or cook or _________ in a school cafeteria. Everyone plays an important in making sure that hungry children get the food they need to succeed in the classroom. Remember, S.M.I.L.E. = Schools Meals Improve Learning Environments. Secondly, she was right! Things do taste better when we smile and think positively about them – and children are more likely to taste a new food if it is served with a smile . I love the “12 Days of Great School Meals” campaign that Director Cleta Long is doing in Bibb County School District, School Nutrition Department, Georgia. Through her Eat Right, Be Bright Facebook page and Twitter account, Long is sharing gorgeous meals from around the district, with kudos to the her staff for their food, their decorations and their photos. What I noticed immediately were the smiling faces of the happy children. 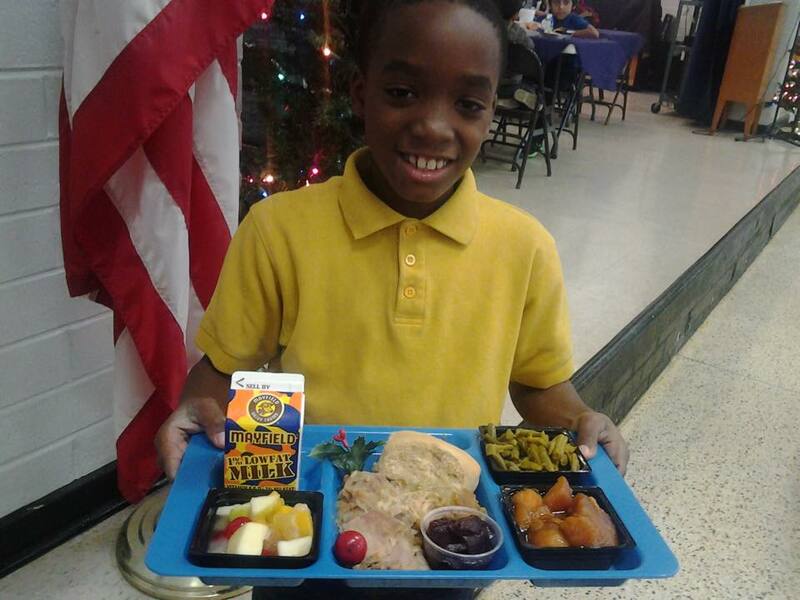 “Morgan Elementary selected this handsome student to present their Holiday Meal complete with a spring of holly. The Holiday Meal included Savory Turkey and Dressing with Gravy, Candied Sweet Potatoes, Green Beans, Holiday Fruit Salad, Cranberry Sauce, Whole Grain Hot Roll and a variety of Cold Milk.” The student is handsome and the food looks delicious. Bibb County is offering a free breakfast and lunch to all students using the Community Eligibility Provision. For some students, this will be one of their most festive and nutrition meals of the season. I’m now sure if the photographer posed this photo on purpose, but the student sure looks SUPER excited to enjoy his SOUP-ER meal. 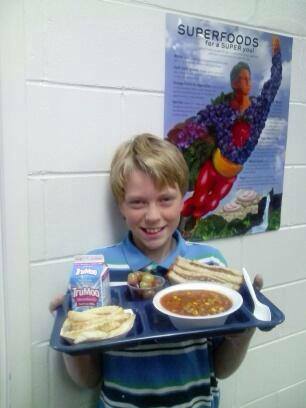 On the “Fifth Day of Great School Meals,” Hartley Elementary served hot house-made vegetable soup with a crispy grilled cheese sandwich,golden baked ‘fries,” fresh grapes and cold fat-free milk. Looks like SMILES all around in Bibb County School Nutrition Department – where I’m certain the food tastes as good as it looks!